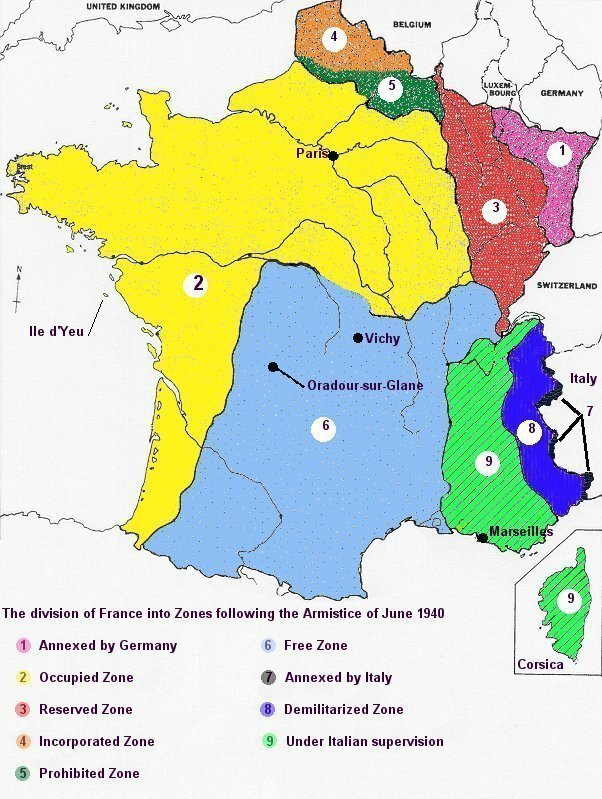 The map below shows the 9 Zones into which France was divided following the armistice of June 1940. The territory of the so-called 'Vichy France', or 'The Free Zone', was the area covered by zone 6 on this map. In addition to the boundaries shown, Zone 2 also had provision for a 10 kilometre wide strip extending along the whole of the western coast of France; this was however not always enforced. The sense of French national trauma can be gauged from looking at this map. Their country with its long and detailed history was ripped apart and pieces of it were disposed of as the victor thought fit, with scant regard for the feelings of its inhabitants. The Ile d'Yeu was where Marshal Philippe Pétain spent the last years of his life following his trial in July 1945, until his death in July 1951. He insisted until the end, that his actions in agreeing to the armistice of June 1940 had saved the French people from disaster. "The French people will never forget that I saved them (by setting up the Vichy State), as I saved them at Verdun". Eighteen months after his death, the trial took place in Bordeaux of all the surviving members of Diekmann's troops who could be identified, including the 21 who were tried in person, see Chapter 5.